After Brief Deployment, Brazilian Troops Recalled From Streets Of Capital : The Two-Way Brazil's embattled President Michel Temer mobilized members of the military amid clashes between police and protesters calling for his ouster. By midday Thursday, he had revoked his deployment order. 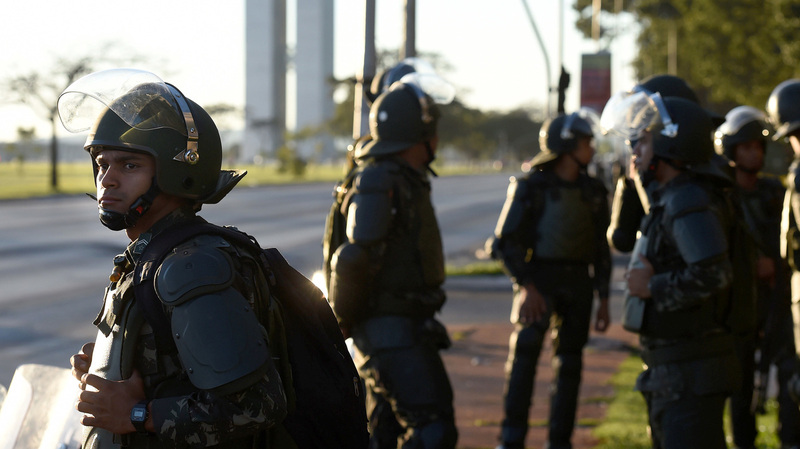 Military police guard government buildings in Brasilia on Wednesday. Brazilian soldiers deployed in the capital after protesters demanding President Michel Temer's ouster smashed windows and fought riot police. But by Thursday, they had been recalled. Within 24 hours of their deployment in Brasilia, Brazilian troops left the streets of the capital on Thursday — gone from their positions guarding government buildings almost as quickly as they'd manned them. The decision, in both cases, came down from President Michel Temer. The embattled politician ordered the military deployed to help quell the massive protests against his tenure Wednesday — protests that turned violent as demonstrators clashed with riot police and smashed the windows of some public buildings. By the end of the day, roughly 50 people had been injured and one building set aflame, according to Reuters. Less than a week ago, Temer had delivered a defiant televised speech, saying he had no plans to step down even as the country's supreme court opened a bribery investigation against him. Successor to an impeached president and polling in the single digits himself, Temer has been on tenuous political footing since virtually the day he stepped into office. But he has been reeling since the release of a secret recording that appears to reveal him endorsing the payment of hush money to an imprisoned former political ally. The revelation only further embroiled him in a massive web of bribery and money laundering scandals that have come to light as part of Operation Car Wash, a yearslong federal corruption probe. "I will not resign. I know what I have done," he said last week, as BBC translates. "I never authorized any payments for someone to be silent. I did not buy anyone's silence. I fear no accusations." Reuters reports that since last week, no fewer than 15 petitions to impeach Temer have been filed — but the wire service notes that as long as another Temer ally remains speaker of Brazil's lower house of congress, those petitions are unlikely to come to a vote. 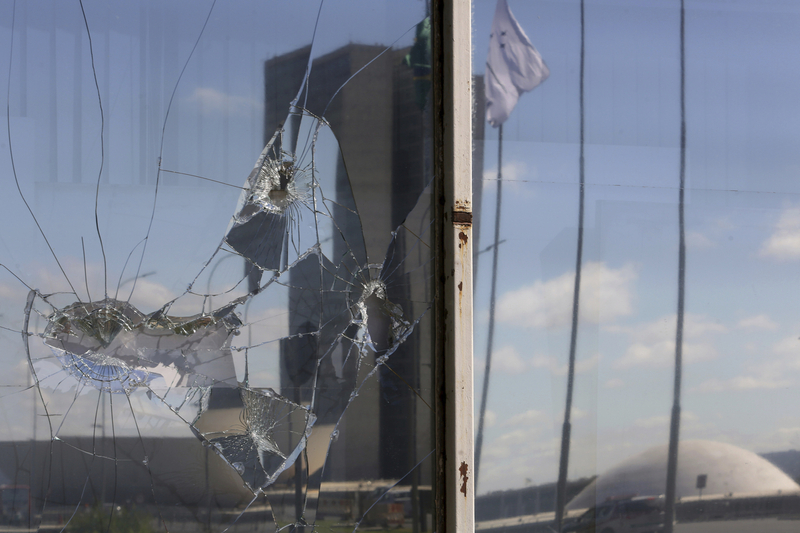 The reflection of Brazil's National Congress stands splintered in the broken glass of a federal building in Brasilia on Thursday, one day after protesters flooded the city's streets in opposition to President Michel Temer. "It is the first time since 1980 when Brazil was under a military dictatorship that something like this has happened and it is causing quite a controversy. "The fact of the matter is President Michel Temer signed the order to bring out the soldiers. The fact that he did this is seen by many as an act of desperation — a smokescreen at a time when he is under increasing pressure to resign." Though Deutsche Welle notes the deployment of about 1,500 troops had been originally intended to last a week, he revoked the order by midday Thursday, citing a "halt to acts of destruction and violence and the subsequent reestablishment of law and order."